This granola is pretty rad, and provides yet another way to use up overripe bananas; serious score in my book. The ingredients you need are likely in your pantry RIGHT THIS SECOND. WHOA. EVEN the wet ingredients: coconut oil, agave nectar or maple syrup, vanilla extract, and a big ol’ ripe banana. Look how friggin’ good that looks; and it’s not even baked! Hubba hubba. Plus, it takes about 30 minutes start to finish and is the perfect breakfast or on-the-go snack. John loves his granola over yogurt. I prefer mine straight up with almond milk (or straight outta the jar #fistfuls). But it also makes the perfect topping for smoothies, creamy oats, frozen yogurt, and ice cream. 30-minute vegan granola that tastes JUST like banana bread and is loaded with protein, fiber, healthy fats and omega-3s and 6s. 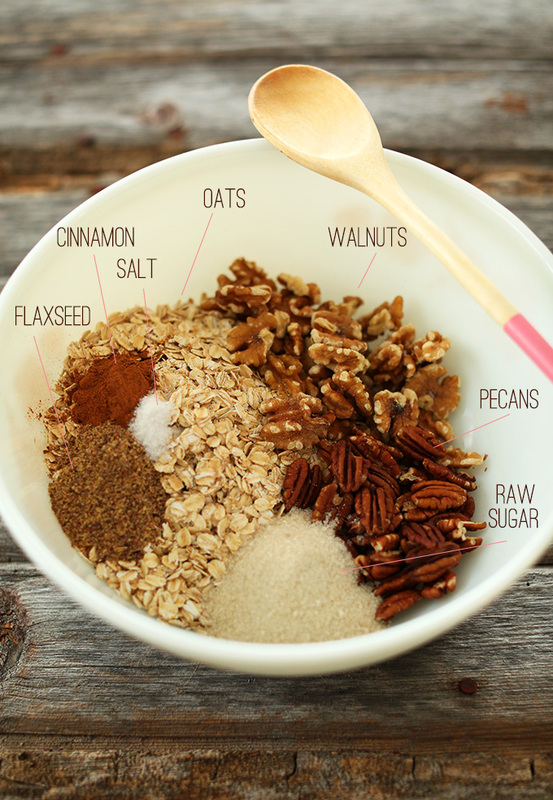 Mix the oats, cinnamon, sugar, salt, flaxseed, and nuts together in a large bowl (see photo). 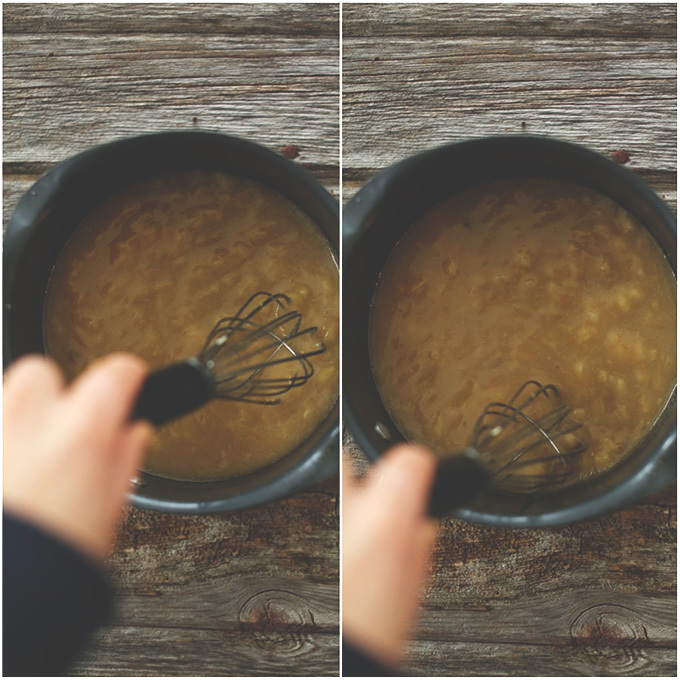 In a small saucepan over medium low heat, warm the coconut oil, maple syrup (or agave or honey), and vanilla extract. Once liquidy, remove from heat and whisk in banana puree until well combined. Pour over the dry ingredients and mix well. Spread the mixture evenly onto one or two baking sheets (making sure it doesn’t get crowded // use additional baking sheets, as needed, if increasing batch size) and bake for 23-28 minutes or until golden brown. The coconut oil will help it crisp up well, but be sure to watch it carefully as it can brown quickly. NOTE: If you don’t toss the granola while baking, it will get clumpy, which I personally love. But if you want a more crumbly granola, toss/stir a bit at the halfway point to break up the clumps. Once the granola is visibly browned, remove from the oven and toss just a bit to let the heat escape. Cool completely on the baking sheet or in a heat-safe bowl. Store in a container or jar with an air-tight seal – it should keep for a couple of weeks. *Yields approximately 12 half-cup servings. Thankyou for your lovely recipes! Hi, sorry to be a pest but how much is each serving size in grams? We didn’t measure that, Jennifer. But our best guess from adding up the metrics of the ingredients would be about 60 grams per serving. Hope that helps! Wow, right when I decide, “no, -this- one is my favorite MB recipe,” I find another masterpiece! I only had walnuts and slivered almonds in my pantry, so I used those, and I only had flax meal, not seeds, so I used chia instead. I’m looking forward to trying new combinations of nuts and seeds. I also used coconut sugar instead of raw sugar. YUM. Perfectly toasty, just a touch sweet, and so easy to make. Thank you! This made my apartment smell amazing. It tastes great too. However, after letting it cool down and crisp up for quite some time it remains a bit on the soggy side…I followed the recipe exactly, what do you think I can do differently next time? We would say try using a smaller banana next time! Hope that helps! 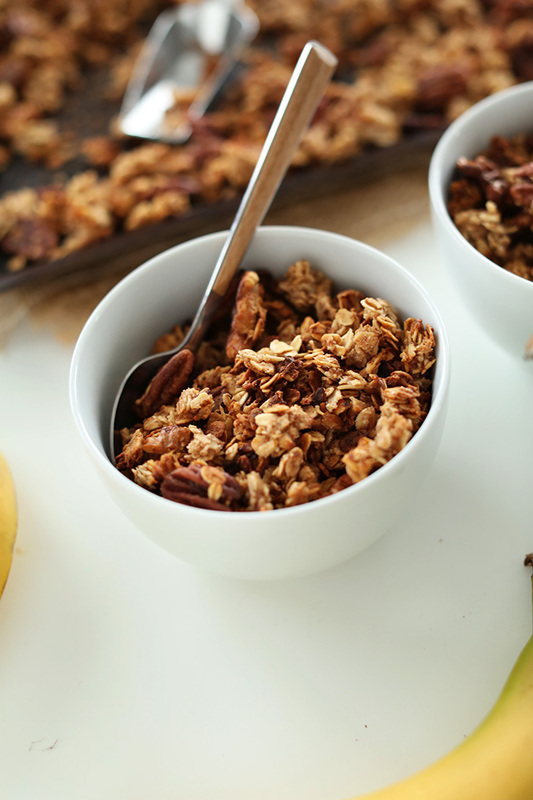 This granola was absolutely delicious and perfect for putting ripe bananas to good use! I added 2 ripe bananas instead of 1, along with already-salted mixed nuts, and the result was salty-sweet goodness! I also added chia seeds instead of flax for crunch. I’ll be making this one for years to come! Your modifications sound delicious, Rebekah! Thanks for sharing your experience! I know this post has a million comments and ratings, but here is another! I’ve made this recipe dozens of times over the years (3 times in the past month!) and figure it’s time to post. I don’t often make it the same way twice, but my favorite modifications are simple: add 1 Tbsp chia seeds and 2 Tbsp hemp hearts. Ups the nutritional value and adds to the nuttiness (at least the hemp hearts!). Thank you for my favorite granola recipe EVER. Yay! We are glad to hear that, Holly! One word: Woah! I almost wanted to hide it from my husband. Actually, I put a sticky on the bag saying to please be mindful of the granola….as I want it to last so much longer!!!! Hah! We are glad to hear that you enjoyed it, Kiti! This is my favorite granola recipe! Just the right amount of crunch, sweetness and sustenance from the nuts. I’ve been making it for friends as gifts :) Dana, I wonder if I could add brown rice cereal to it for some crispness. How much more of the liquid ingredients do you think I need to add if I wanted to add 2cups of rice cereal? Thanks so much! I’ve made this recipe so many times now, it’s amazing <3 I sometimes add chia instead of flaxseed when I don't have any, and I also play around with the nut combinations and ratio – I usually add a cup of almonds and the rest is walnuts. Another thing I add sometimes is banana chips which isn't the healthiest but I really like it so I add a handful to the baked and chilled granola, and I'd also add crushed cocoa nibs or chopped dates or something. You can get very creative with it. Hello! Another delicious recipe. Yum! This did indeed make my apartment smell completely banana bread-y scrumptious! General question about coconut oil. I noticed in some recipes that you call specifically for “melted” coconut measurements. Not this one though: Does it make a difference if the oil is melted or not when measuring it? My kitchen has been getting pretty hot lately and the coconut oil jar is totally liquid some days. So for this recipe I used the melted amount of what you suggested. The granola did brown but I had to keep it in by about 8 minutes beyond what you suggest! Of course my oven is probably lackluster compared to what you use. But still my question remains! Thanks for taking the time to share the love! Peace. Hi Dallas! It doesn’t really matter whether you measure melted or non for this recipe though as it is added to the saucepan in step 3 and will be warmed up anyway. As for the cooking time, that can always vary a bit but we always offer a cooking time, or until golden brown because oven temperatures can vary. Hope this helps! This is thee best granola I’ve ever had or could possibly think of making. My husband is a tough crowd and he was impressed. We love it!! Gah! SO good!! Dana, you are a genius. I seriously don’t make any other food bloggers recipes because I like yours the most :). Hi Jazzu! We haven’t tried using applesauce and can’t say for sure, but I would think that your initial thought is correct and it may be too mushy/wet. If you give it a try, report back on how it goes! Thanks Dana! I made his granola and was so impressed! Your recipes inspire me to experiment with my own ideas. So this time I took some liberties with this recipe. Swapping 1 cup of oats for brown rice cereal. Subbed coconut sugar, pumpkin seeds & cashews, pumpkin puree, 1 tbsp of brown rice syrup Instead of the extra maple and used pumpkin pie spice in place of cinnamon. So darn good! Hi, What can I sub the sugar for? Maybe coconut sugar? Hi! You could sub some powdered stevia, or up the amount of honey. Hope that helps! This is maybe my favorite recipe I’ve ever found on the internet. I add dried apples and pumpkin seeds to it sometimes. Magic. Hi! This granola looks super yummy. If I left out the added sugar (but left the maple syrup), would the recipe still work? Or does the sugar serve a purpose other than just sweetness? Thanks! Hi Molly! You could but it obviously won’t be as sweet. You could sub some powdered stevia, or up the amount of maple syrup. Hope that helps! Hey. What is the best way to store this? Hi Ramona! Store in a container or jar with an air-tight seal – it should keep for a couple of weeks. I make this granola weekly!!!!!! I eat it every morning for breakfast (on its on with milk, over yogurt, over oatmeal, etc..) and I love it so much! The first few times I made it I didn’t stir it but now I do and I think I like that better. Or do I? I actually can’t decide because it’s just SO SO GOOD!!!! I want to start adding chia seeds and hemp seeds to my recipe – do you have any suggestions on what amounts to use and if I need to adjust the other ingredients to make that work? Thanks again! Hi! I think you could just add those additional ingredients without adjusting the recipe! Others in the comments added chia and had success! Hi Dana, can I sub the coconut oil for canola/ olive/ avocado oil? Hi! Is this made with ground flaxseed/flaxseed meal or whole flaxseed? Hi Molly! We used ground, but either is fine! Yes, that might be it. Next time, give it a little more room and see if that helps! Any suggestions on what to replace the pecans and walnuts with if you have a nut allergy? Hi Cait! What about raw pumpkin seeds, sunflower seeds, and unsweetened coconut flakes? Hope this helps! I Made this and it’s stunning. Just wanted to know the nutritional facts are for the whole batch or per serving ??? Hi! It’s for a 1/2 cup of granola! Perfectly delicious! I used a dark heavy pan and a “silpat” mat, and 30 minutes at 275 worked best for that combination. I’ve made thus 3x already & it gets better & better. Pumpkin seeds, walnuts, pecans. All of them or whatever you have in hand. I always have to triple the recipe and there’s no one here but me and mom. 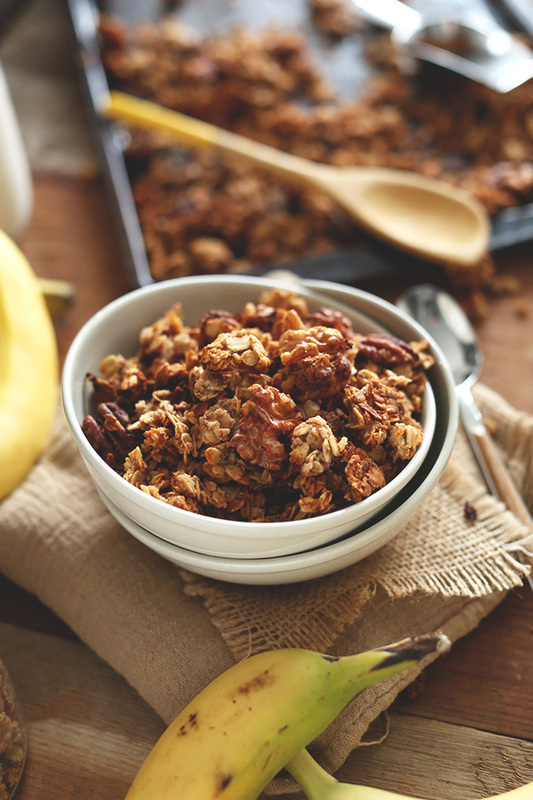 We LOVE knowing exactly what’s in our granola! Thank you so much! Its a hit! Dana you have great recipes! Yum! 4th time making this, it’s our fave! Subbed sliced almonds for pecans this time and wowza, love it! Can’t wait to mix it up by using sweet potato instead of banana one of these days. So easy, so super delicious! This is soooooo good and easily adaptable. I don’t eat oatmeal so added some coconut and seeds which made it a grain free option. On top of that I had some pumpkin puree I wanted to use so I replaced the banana with that. You could really make so many changes as you needed according to your own diet. This batch will be gone in no time I’m sure! We have nut allergies, so we substituted a combination of raw PUMPKIN SEEDS, raw SUNFLOWER SEEDS, and unsweetened COCONUT FLAKES for the nuts. And it’s delicious. Here’s another tip: I used COARSE SALT so that you get little salty bursts. I love it. So good! Stuck to the recipe except I had a mixture of rolled and quick cooking oats, used coconut sugar instead of raw sugar, and reduced the maple syrup to a 1/4 cup. Also added hemp seeds, chia seeds and buckwheat groats! this recipe is a blessing in my life. first time making granola and it couldn’t have been easier. my family loves it. left it in the oven for a bit too long… burned, but thats ok,, next time I’ll make it at 340 degrees for 5 minutes less. my oven is hotter than the average oven. Could I sub peanut butter for coconut oil? I have all other ingredients but no oil/butter except for PB. Thanks! Hi! Most likely not, not without compromising the sweetness and moisture level. Hi! I love the way this recipe sounds. Do you know if there’s another kind of oil I can sub for the coconut oil? Annnnnd, I just read the rest of the comments – should’ve kept scrolling! Thank you, can’t wait to try this. I have made this twice and it was delicious !!! Is there anyway that I can make this using fresh blueberries instead of banana? Hi! It should work. We haven’t tried it, but if you do let us know how it goes! Can I substitute Unsalted butter for the coconut oil? I would say go for it! also olive oil worked for me! I made this recipe for the third time and here are my tweaks. The first two times it turned out exactly the same, the granola was a little soggy and chewy rather than crispy, which I didn’t like. Also, the nuts burned when I added them at the beginning. I used less maple syrup, 1/4 cup instead of 1/3 cup + 1tbsp and also a little bit less than a full banana (I took off maybe half an inch). I added the nuts in ten minutes before the granola finished cooking. Came out great and actually crispy this time! It’s in the oven… but I already had to have a bit ;) Soooo good! Thank you! Hi! Melted earth balance or olive oil will work instead! absolutely! I used a mixture of seeds and coconut one time instead of nuts and it came out great! I made this recipe for my vegan- gluten free diet and oh my, I loved it. I omitted the sugar and it’s already sweet for my taste, just make sure you have a very ripe banana. I also baked it longer than 28 minutes, because it was still soggy at 28 minutes- it’s probably my oven. I eat the granola with almond milk and banana slices. Delish and filling! I will make it again this weekend. Thank you! This is the best granola I’ve had/ever made! I make it at least once a week and triple the recipe in order to have it last more than an a day! Thank you so much for creating and sharing such a wonderful recipe!! I just wanted to thank you so so much for your brilliant work. I am a passionate cook who recently got diagnosed with lactose intolerance and for another problem I cannot have gluten either. Your recipes are all so wonderfully researched, they are saving me time when I don’t want to do the work myself and inspiring me when instead I feel like I want to experiment. Thank you, so so much!! This granola made the house smell so beautiful yesterday night, and it is now my absolute go-to recipe! I made this recipe with my mom this evening and it is heavenly! I may or may not have stuffed myself with unreasonable amounts of granola right after having your Brussels sprouts pasta recipe for dinner. We added 1/4 cup raisins and subbed the pecans for almonds, used only 1/3 cup honey and used golden flax seed as that was the only type we had. It turned out AH-mazing. This is the second one of you granola recipes that I’m making. First was the sweet potato one which was awesome and my mom’s absolute favourite! I’m so disappointed in myself, I don’t know what I did wrong. I followed the recipe exactly. Just pulled it out of the oven and even though it was very brown, it was very soft. I can’t figure out what I did wrong. Does it harden after it cools or should it come out of the oven hard? Where did I go wrong? Mine was also soft when I took it out of the oven but as it cooled down it hardened and I was able to break it into clumps. I think it’s normal, just like cookies are very soft while still hot but after some time they become harder and crunchy even. This is heavenly!!! I’ve made it twice so far. The problem I encountered both times was the bottom getting too brown, almost burnt after a little over 20 min but it might just be my baking sheet, not sure why. The recipe says not to toss it to make it clumpy, but I think next time I just have to toss it to prevent the burning. Also the second time around I used less sugar, 1.5 tbsp instead of 3 and added more pecans! Thanks for a great recipe. I made this today for the first time. I subbed sliced almonds for walnuts and used two bananas, because I had them. The deliciousness is so dreamy. I can’t even. Tell. You. Thank you so much! I made this last night and it made for the best breakfast today! I usually follow a recipe only the first time and then tweak it to make improvements. This is just perfect! I made this granola and it was amazing. I ended up already having all the ingredients in my kitchen. I had just the perfect amount of pecans. It was so delicious and crunchy. My family loved it. I’m now planning on making a batch to give a long with christmas gifts to my friends. Who doesn’t like granola? I love this recipe so much. I’ve never made the same single recipe so much before! I didn’t use pecans as they’re more expensive than gold here but the taste of the toasted walnuts is enough. So heavenly. I end up eating more as a snack than I do for breakfast sometimes because its SO good. Honestly dangerously good. Sometimes I purposely don’t make it because I know I will end up eating it all as a snack haha. So delicious! Thanks for the recipe! Daughter and I enjoyed these today. I’d made a three ingredient version first (using up bananas: 2 bananas, 2 C oats, 1/2 C raisins). At first she just said she liked them the same…. ??? 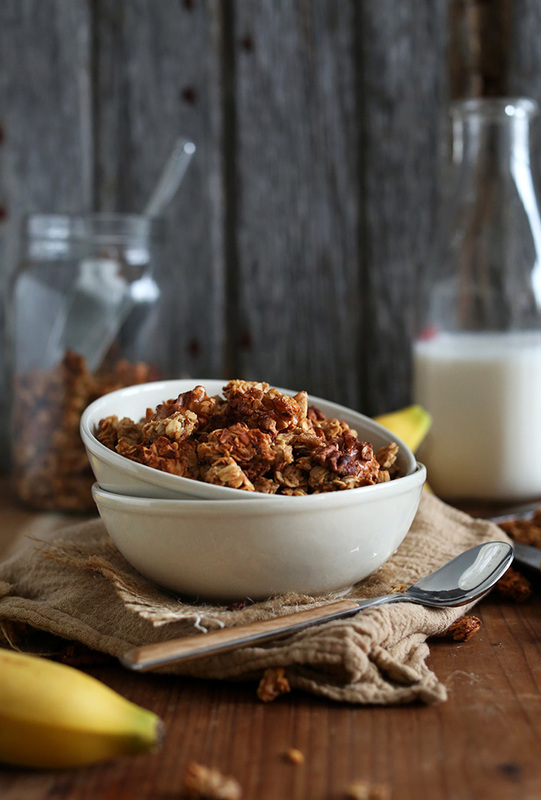 I thought, are you ill, this Banana Bread Granola is wayyyy much better!? Then she came out with the telling truth: She wanted raisins in this recipe, so she’d have the best of both worlds. So there you have it. We love this! Thanks! This rocks. It makes the house smell soooo good. Plus it has the best crunchy consistency, I don’t know what it is, maybe the banana, but this recipe has turned out the best for me, among other granola recipes that were rather chewy. This is a yummy recipe but I feel like 350 is way too high for granola. Mine started burning after 10 min even though I stirred it often. Sorry to hear that Ewa, try a lower temperature (300-325) and check it every 5-10 minutes! What can you use in replacement of raw sugar? Oh! I see someone said they used all maple syrup! I may try that! Or agave, or brown sugar? What are the special properties of raw sugar? You could try and use coconut sugar! BEST GRANOLA EVER!! I made my first batch late this afternoon and kept nibbling at it while I made dinner. I finally gave up and had a small bowl with almond milk for desert. I’ll be making this on a regular basis and will definitely be my go-to for Christmas gifts! This stuff is SO moorish. I omitted the raw sugar and added 1/2 cup of maple syrup. Fantastic recipe that will be on regular rotation in our house. Do you have a suggestion for what I can use instead of banana? My daughter is allergic to bananas. Just made it according to the recipe and it is wonderful! In the text part of the page, where the pictures are located, there is a comment from the author, stating that substitutions of pumpkin, pureed beets, and I think it was applesauce, were all good. This is some fabulous granola. I had to make some changes myself due to food allergies, and it came out so well that my very non-health-food husband ate the whole batch! This is the best granola I’ve ever made! I just made these and it was a huge mistake. They are SO good! I might eat it all in one sitting. Next Christmas everyone is getting this as a present. So SO good!! Love this receipe. I cook at a lower heat longer to avoid burning(and subbed the coconut oil for butter) but I love this receipe. 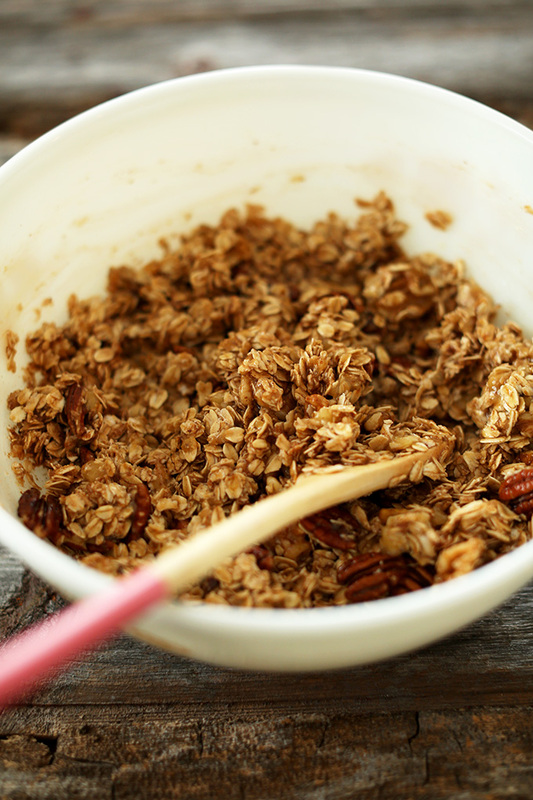 This is the best granola recipe out there—seriously! It’s in regular rotation in our house. I blend plain kefir with Maine blueberries and top it off with a 1/2 cup of this granola… so addicting. Thank you for the wonderful recipe! I’m not Dana, but I’m sure you could! :) Good luck! Best granola recipe I’ve ever made! Delicious! I’ve just made this recipe and it’s in the oven now. It smelled so good pre-oven that when I went to lick the spatula I accidentally drooled all over the floor instead [blushes]! I can’t say this has ever happened to me before. Can’t wait to try it! I burn/ruin everything I bake, but this is un-ruinable. AND everybody in my life now loves me because I’m making banana bread granola. Seriously, thank you. AMAZING with yoghurt, and looks super cute on my counter in my mason jars. Look at me adulting! YAY!! I’ve also baked the banana muffins with the crumble tops and am making your sweet potato chickpea buddha bowl for dinner. Minimalist baking is now my life. Oh. My. Gosh. This is DELICIOUS! I’m literally finishing my 11th serving (1 left!) in 5 days as I type this. I am always having a hard time finding quick and easy snacks to prepare on the weekends that are healthy, yet nutrient dense enough to fuel my activity throughout the week, while yet still meeting my crazy dietary needs too. Oh! And it would nice if they tasted good too?? Healthy, clean, quick and easy, vegan, gluten free, nutrient dense. Aaaaand sooo GOOD! Absolutely delicious! Thank you for such a wonderful website! Is the flax ground flax? How did I not see this recipe before?! *Running to pantry for ingredients* This is going to be EPIC. I’m hoping half will end up going in a jar for a Christmas gift for my step-mom who is impossible to buy for. I love banana bread and muffins so much that I have a hard time not eating the whole thing as soon as it’s out of the oven! So this granola clearly won’t last as long as the previous batches I made but well, everybody deserve a treat at this time of the year ;) And just for the great smell in the whole apartment that lasted for hours it’s worth making it! Can I use EVOO in place of the coconut oil? And regular sugar in place of the raw sugar? Same amounts? How do you think steel cut oats would sub? I just made it and the whole house smells delicious! I really love the taste of it, but it was a little too sweet for my liking. For the next time, could i just use a little less maple syrup and more coconut oil? Yes, I’d reduce the maple syrup! The smell… The flavour… 5/5! just made this! i added a little less sugar and it was awesome!! it’s going to be hard to not eat it all at once. thanks for sharing! Oh My Gooddd.. really does taste like banana bread!! so dangerous! hahah..
Hi Dana! I made this recipe today and it’s fantastic! Thank you! My batch was ready at 20min maybe because my oven runs hotter. Next time I will take it out at 16-18min because a few pieces were a little dark. Thanks again! My family absolutely loves it!! This recipe is amazing. Well most of your recipes are. Thank you for sharing. You are a wonderful resource for new vegans that cook. Was lovely granola – too sweet for my taste buds though – might leave out raw sugar or reduce the amount of maple syrup. I have never heated up the wet ingredients before because its all already liquid – any specific reason you do it? Just made your granola bars – we love them at our house. 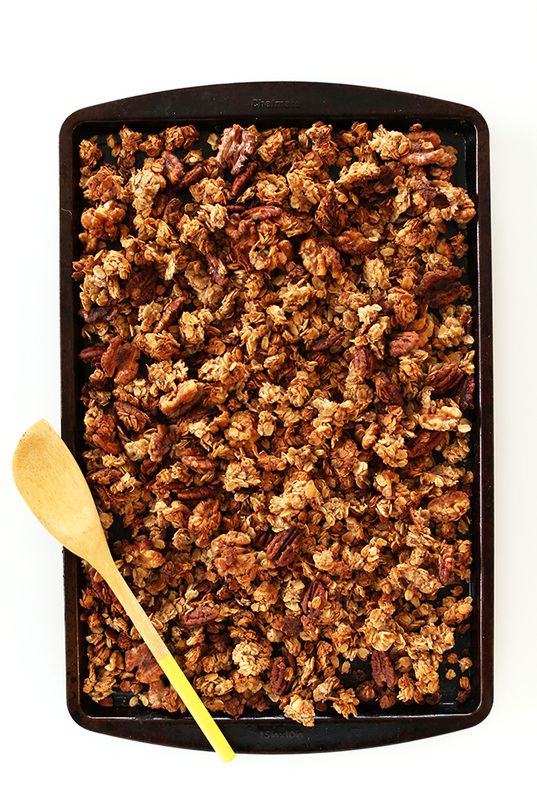 And this granola just came out of the oven and I tried it right away – delicious!! I substituted flaxseed with chia seeds and added shredded coconut halfway through – yum. Can’t wait for breakfast tomorrow! Great website. Our whole family is in granola heaven! I made my first batch ever yesterday and even my very finicky 8 year old paid a compliment and wanted seconds :) We’ve had it with yogurt and fresh, sliced bananas and a sprinkling of chia seeds. Just yum. The only thing I changed was using olive oil instead of coconut oil and it worked like a dream! Ever since seeing this post a few months ago, I’ve been making this recipe regularly. I live inFrance, so I’ve shared it with a few French friends (who hardly know what granola is, and certainly don’t know the pleasures of a good, spiced banana bread). They LOVE it, and each person who has tried it has, without fail, asked for a jar of it. This stuff is seriously addicting. NOTE: I find that the nuts (especially walnuts) tend to burn before the oats have fully toasted and seized. Have had to pluck too many burnt walnuts from the final mix, so I think I’ll try adding them about half-way through cooking next time. Other than that, I have had excellent luck with this recipe every time. Pro tip: serve with some sliced bananas with almond milk, or yogurt, or–why not–a bit of coconut cream. Mmmm. Great! Thanks for sharing, Angie! Hi, I just found this recipe and I’m excited to try it. One question, I only have flaxseed meal on hand. Will that still work? Amazing!! My three-year-old-daughter and I made this today, and it is so freaking delicious!! I have to keep her away from it so I have breakfast for the week! Just as good as your pumpkin maple granola, which we’ve made a few times now. I left out the sugar from both recipes – and didn’t miss it at all. Thank you for these wonderful, healthy granola recipes. So glad to have found your site! Would love to make this, just not a big fan of walnuts or pecans- any suggestions to substitute these? I make this granola so often because it’s just so good! By now I tried it with different oats (quick oats work just as well), nuts and “add ins”. I absolutely love it with hazelnuts! I’m actually just put a batch in the oven as I type this haha. It’s also nice as a gift because it’s easy to make but everyone thinks it’s something really special. This looks amazing! Would it work with quick oats instead of rolled oats? I’m celiac and would have to order GF rolled oats to make this, but already have quick oats on hand! I think so, but it may differ the texture. Let me know if you give it a go! This is a major hit in our house (as well as all your other granolas we have tried)! I added cocoa nibs because we like chocolate in our banana bread. Making again this week and thinking of adding some dried fruit for a bit of a chew! This is the best granola I have ever had!! It tastes exactly like banana bread, and without the butter/white flour/ white sugar regrets!! I saw this recipe when I was looking at your peanut butter granola recipe (which is wonderful, by the way). My daughter thought I was nuts when I told her it sounded interesting. I made it today while she was at school, and now I can’t wait for her to get home and taste it. My son and I both agree it is fantastic! It tastes just like banana bread! 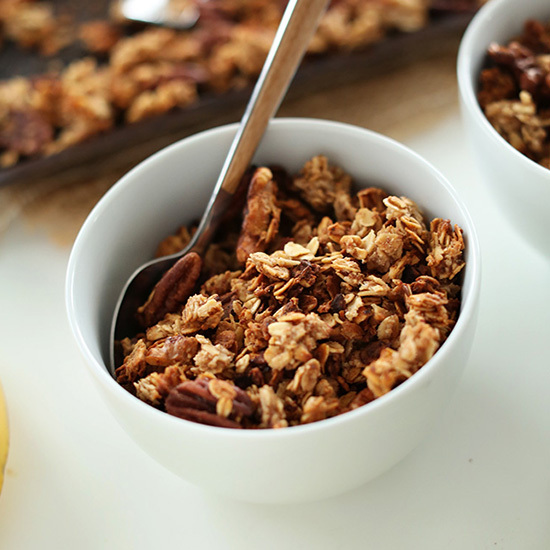 This one will definitely become a regular in our granola rotation. Thank you for such a wonderful recipe! I can’t wait to explore some more of your recipes. Whoop! Glad you liked it!! I’m opting for homemade goodies for Christmas gifts this year and I’m totally gifting this granola! It just came out of the oven and my apartment smells fantastic!! :) I added some popped quinoa & buckwheat groats that I had lying around. The real challenge will be to see if I’ll be able to stop eating it before I give it away!! So smart! So glad you are enjoying it, Tracey. Happy gifting! Hello! This looks perfect for Christmas gift-aways. But I was wondering if the sugar in the recipe can be subbed with something else or removed entirely without compromising on the taste? Tried this recipe and it turned out fantastic! I substituted banana for sweet potato and I substituted the coconut oil for vegan earth balance butter. It turned out amazing and made my condo smell wonderful. This is now my go to recipe for granola! Lovely! Glad you enjoyed it, Ashley! In the words of my four-year old daughter, “this- is- a-mazing!” Thank you so much for sharing a delicious and nutritious granola recipe. My four-year old son helped me make your granola recipe, it is a perfect beginner recipe for kids in the kitchen. I posted how he made it on our blog. My husband and I were both surprised at how much banana flavor actually came through in the granola. This is our new favorite granola- goodbye fancy bagged granola! WOW! WOW! I made this thinking it would be a novel way to use some ripe banana, but I didn’t think there would be any chance it could bump my go-to #1 granola recipe out of its place. My goodness, the mix of maple syrup and banana and coconut oil has left my mouth drooling for more. This is incredibly tasty and I am delighted to taste the banana flavor coming through. The outside pieces which got a little browner are causing me to nibble more and more. I used coconut sugar and bran in place of flax seed, but otherwise followed the recipe as is. Dana, this is FANTASTIC! Thank you for sharing. The banana taste is – – – incredible. This tastes so much better than the pricey bags of granola that we occasionally splurge on. We love the perfect amount of sweetness that you created. We already sampled it in a Greek yogurt parfait- the kids DEVOURED theirs. By the way, my 4 1/2 year old son helped me make this, it’s an excellent kids-in-the-kitchen recipe. I’m sure we’ll be making another batch soon. Thank you for a healthy and delicious recipe for me to feed my family! Just made this. The most wonderful scent has filled our house! This will be a regular in my recipe book. I can’t wait to try this but I am allergic to seeds. If I leave out the flaxseed will it still be as good? And as nutritious? Yes! You’ll lose a little nutrition, but that’s OK! This is such a great recipe – the banana adds excellent moisture, flavour and natural sweetness. Nice. Glad you enjoyed it, Irene! This is the best looking and sounding granola, I have come across. I think even hubby would like this and he uses frowns on granola. Let’s see if I can thank you for working miracles on him. I have some in the oven right now…smells really good…I also added hemp hearts for added protein and used organic coconut sugar! Hopefully it tastes as good as it smells! I subbed the banana with pumpkin puree since we were out of fresh bananas and ohmygosh I LOVE IT. I couldn’t resist not eating it so now there’s probably only half left, oops! thanks so much for the recipe! It was love at first sight & bite :-) Thanks for the recipe! I will share it on my blog. I made this granola the other night – it tastes amazing, I love the little bit of salt. I tossed shaved coconut in during the last 5 minutes and added banana chips right after it can out of the oven. Tonight I ate a big bowl with homemade vanilla cinnamom almond milk. The perfect pair, I could have eaten the whole batch! Found this amazing recipe on Pinterest today…. In the oven as we speak! Smells like heaven. Planning on topping my favorite nice-cream tonight and blog about it tomorrow. Of course I will be giving a link to your lovely site. Thanks for sharing the recipe! Ha! Such a great exchange! Thanks for sharing, Megan. We’ll be in Portland this summer so we’ll have to connect! This recipe was delicious! One of the best granola recipes I have tried. I used brown sugar instead of raw sugar and it turned out perfect! Thank you! I have made this 5 or 6 times and each time change it a little…. With or without the banana, plus dried fruit ( dates, apricots, cranberries…) plus flaked almond, macadamias, pecans. Best addition though is shredded coconut. I have also used golden syrup when I didn’t have enough maple syrup and that worked too. Basically this recipe with whatever I can use from my pantry and the kids (4 and 15 months) and hubby love it every time. Thank you. I love love love an adaptable recipe to reduce any waste from the pantry. Also great to know what’s in our breakfast cereal. What a great start to the day. So great to hear! Thanks for sharing your modifications, Janine. That’s so helpful for other readers. Glad you’re enjoying this recipe so much! Cheers! Since coming across your website I’ve made this AMAZING granola at least 3 times. The aroma, the flavor oh so divine! My family and friends have thoroughly enjoyed this recipe, so thank you. So great! Thanks for sharing, Veronika! I love this recipe! The smell is intoxicating! I added freeze dried strawberries from Trader Joe’s to end product and it tastes amazing in a bowl with almond milk. Thank you! Right? It takes over your entire house with yummy banana bread smells. So yum! Thanks for sharing, Nicole. Absolutely in love with this website! Its so perfect and simple, I’m all for easy, short recipes! Plus they’re delicious! I just made this and i’m waiting for the second batch to be done! I’m so excited for breakfast tomorrow! Thanks Miriam! So kind of you to say! hey! is it ok to substitute the coconut oil for olive oil? it will change the taste too much? I made this recipe last night and I’m about to have it for breakfast. I’m sooooo excited! It smells amazing and tastes even better! You have no idea how excited I am to be cooking so much right now, this blog is such an inspiration! Seriously- BLOWN AWAY by how amazing this turned out!! I am a week overdue waiting for baby to be born. I was having contractions all night that were keeping me up. Finally at 6 am I rolled out of bed. And what else should one due after a sleepless night then make their way to the kitchen to whip up something yummy and special for breakie?! Long story short, I made this granola and it made my day! I’ve been enjoying it with coconut yogurt and fresh strawberries. Already gearing up to make batch #2! Thank you for the amazing recipe!!! Just made this recipe, still have the great smell throughout my house! Absolutely delicious! I did though substitute almonds for the pecans because I didn’t have any pecans on hand, and it totally works! So if anyone wants to switch up the recipe a little bit, try some almonds for sure. Lovely! Thanks for sharing, Holly. Glad you’re enjoying it! Have made this twice in a week— a winner! tastes exactly like banana bread!! Thank you! I just recently found your blog and have been swooning over recipes! This was amazing granola and we inhaled the batch at a morning meeting. Thank you for amazing recipes and I look forward to trying many more. Absolutely delicious! Hi, Dana. Tried your 5-ingredient healthy granola bar and absolutely loved it! This sounds very exciting too, and am itching to try it. I would like to make bars even with this though; they would make for a convenient snack. Any idea how that may be possible? I was thinking of notching up the honey slightly so the mixture would still hold together. Hooked to your blog btw. It is seriously delicious. The recipes are exciting and the photos, delectable. This recipe is AMAZING!!!! I loved the smell as it was in the oven. I have passed this recipe on to everone I know. Thanks for sharing! Ha! It was internet destiny. Glad this flavor of granola has already made its way into your kitchen. Cheers! Took this out of the oven about an hour ago and OH MY WORD it’s delicious!! So glad I found this recipe. Thanks so much for sharing!!! YAY! So glad you’re enjoying it, Melanie! Thank you for the recipes. I’m looking forward to trying this one and the veggie tofu stir fry. I have made this twice in one week! My preschoolers and hubbie can’t get enough of it and sprinkle it on everything- oatmeal, yogurt, protein shakes, and even by itself! This recipe is a keeper for sure. Thanks! So I’ve made three of your recipes in two days… I may be a little obsessed. :) And I might be overstating this, but I think this granola has changed my life. So unbelievably good. I’m eating it right now as I type. Yum!!! Can’t wait to try your other granola recipes! With the rate I’m going, I’ll have all of them made within a few days! Such sweet compliments! So glad you enjoyed this recipe, Carissa! It’s become one of my favorites already. Cheers! You’ve done it again! Thank you! I “loaned” my baking stuff and I was itching to do something at 10pm this evening and this just hit the spot. My boyfriend loves it and is finishing 1 batch 1 spoonful at a time. I keep telling him to leave some for breakfast. He’s asking me to make another batch since he wants to show it off in the office tomorrow.. Like I said, a hit! I don’t have my flaxseed and vanilla with me so I just used almond extract. I couldn’t resist as well – added some chocolate chips while in the baking tray. Yum, thanks Dana! So glad you’re enjoying it, Leigh! And thanks for the tips/modifications. That’s so helpful for other readers. Cheers! As someone who faithfully makes the sweet potato granola almost every week since you posted that recipe (yes, it’s a true addiction), I was a bit hesitant to try it with bananas however I have to say, this is a fantastic alternative!! Granola came out beautifully and tasty. My only alternatives were to decrease the honey to 1/4 cup (only to save on cleaning), decreased the sugar to 2 tbsp, omitted the vanilla (forgot) and I added chia seeds. Was afraid the chia seeds would get all glutinous on me but turns out not at all. Love the additions/changes! I’ll have to try chia seeds next time to switch things up and add more nutrients! I’m a college kid who LIVES on granola. I have all the ingredients in my kitchen which means I will be making this! Thanks for sharing! this looks amazing.. i am currently on a granola kick and this recipe is next up on my list!! thank you for the recipe and the BEAUTIFUL pictures! Making my second batch tonight! My very picky 2 year old is in LOVE with this granola(I kind of am in love too). My daughter is gluten and dairy free and we have made almost every gf recipe on your blog, and we love them all! Thank you so much for making my life easier with all your amazing recipes. You are the sweetest! Two batches in one night is a true testament to your love for the recipe, so thanks for sharing! I’m eating my second batch right now and will probably eat my way through it by the end of this week. So tasty! That is EXACTLY how I roll when it comes to granola. 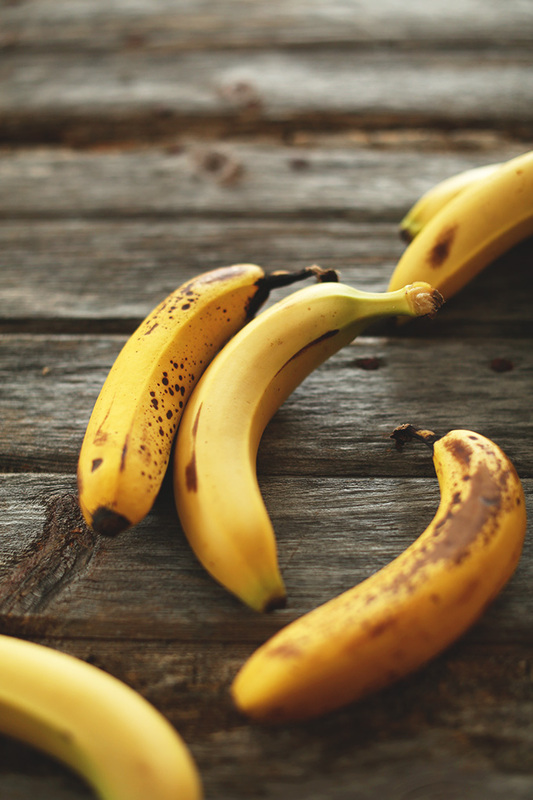 Saving this awesome recipe for my next round of ripe bananas! so I’m baking this granola, and IT SMELLS SO GOOD IN MY HOUSE RIGHT NOW! Gahhh! Mmm! This looks so good. 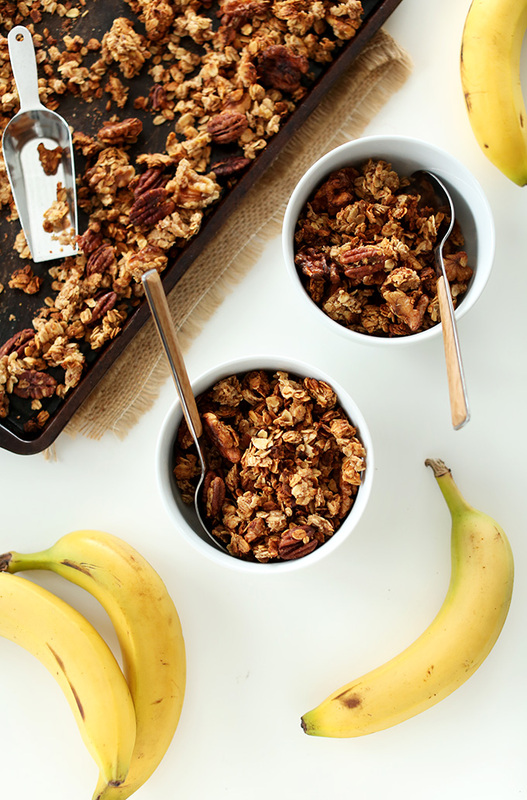 I’ve just made banana granola myself – a slightly different recipe -, but yours makes me want to make this for tomorrow’s breakfast right away! I am not sure if anyone has said this but I made a batch just now with 1/2 cup of applesauce since I had no banana (gasp) and it turned out really good! I am glad you said I could use any other puree in place of the banana. This was super easy and tastey. I am printing out the recipe and will use it all the time now, thanks!!! Made this… Impatiently waiting for it to cool so I can EAT THIS!! My place smells amazing! YUM. This looks amazing! For some reason, I want to add this to some Greek yogurt, but what would you recommend? Yes, technically I’m lactose intolerant too, but I can’t help eating dairy sometimes. I will have to give almond milk a try , and get back on track. Thanks for sharing! I’m lactose intolerant as well, but decided to try greek yogurt with a lactaid for the health benefits and am now in love with yogurt, fruit, and granola!! I’ve made a chai tea latte granola from Sally’s Baking Addiction and can’t wait to try this banana bread one! Yogurt is safe for lactose intolerance. The cultures in the yogurt digest the lactose. I would be careful with commercial flavored ones, but plain or vanilla should be fine. I have a ton of almonds I would like to use, will the taste vary a lot if I sub the walnuts for almond? It will still taste amazing! I love banana bread and granola, how have I never thought to combine the two! Can’t wait to make this. Could you make this without sugar? My hubby is on a no sugar diet right now but this looks sooooo yummy! I am wanting some like right… now! Kari, you could but it obviously won’t be as sweet. You could sub some powdered stevia, or up the amount of honey. Hope that helps! Just made this tonight. I was wondering if you use ground or whole flax seed. I used whole and it came out great! I am going to add golden raisins to the mix to give it a little more oomph, but it tastes fantastic in its original recipe too! Thanks for sharing!! This is a new go to recipe for me! I used ground, but either is fine! Banana bread is maybe on of my favorite foods. 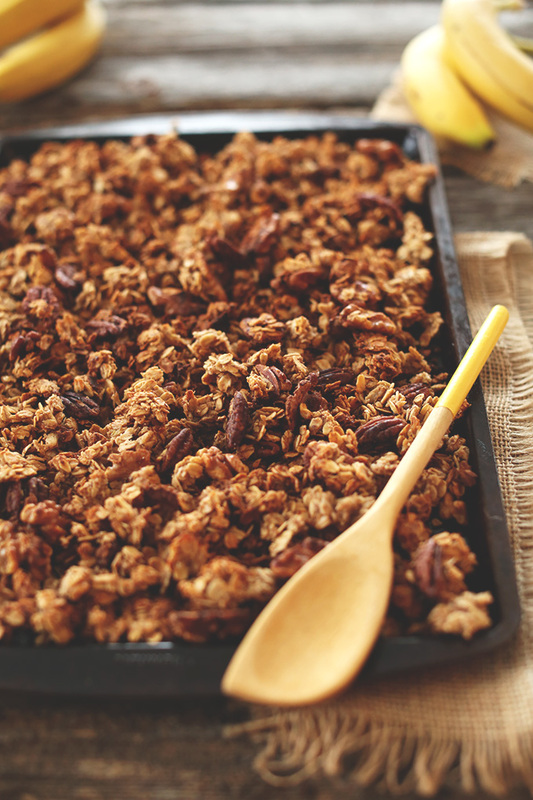 I love and I cannot wait to make this granola! Amazed! All the ingredients are on my shopping list now! I don’t have coconut oil on hand. Is there anything I can use as a substitute, like apple sauce or extra agave nectar? Jennifer, the oil really does make this recipe crisp up well, so I wouldn’t recommend going without it. Can you do melted earth balance or olive oil instead? I used olive oil, and it turned out really well. Thanks! Do you always melt the coconut oil before measuring? Do you use a liquid measuring cup to measure? I actually scoop it, pack it, then melt it! Dee-Lish! This made the house smell like heaven and was so good. Made the Detox Smoothie to enjoy with it, that was amazing too, even my 12 yr old daughter liked it. That is a big deal…if she sees spinach going into the Blend-Tec, she turns her nose up. But she tried it and loved it (made with tart cherry juice and blackberries). Thank you!!! You are on a Minimalist Baker recipe roll! I love it. Thanks for sharing your experience, Sherry! So glad your daughter enjoyed the recipes, too. Cheers! Two of my favourite things combined! Love it! ahh yum! this is an awesome remix of the standard granola. 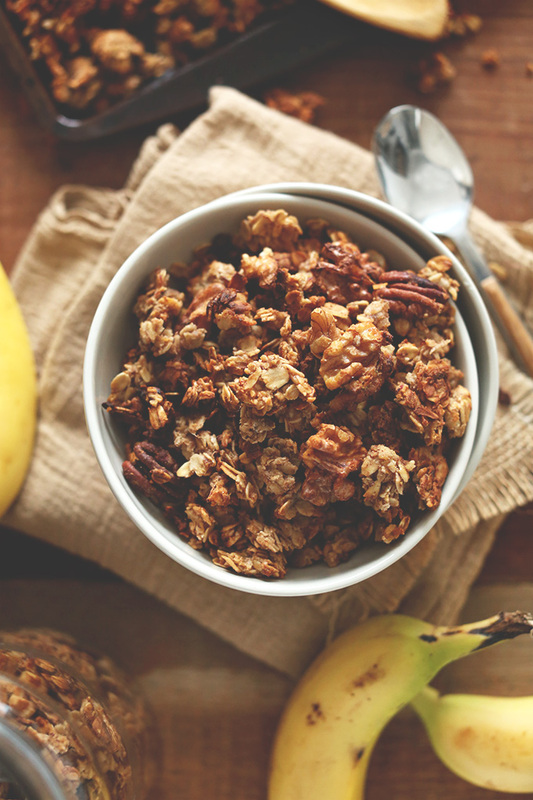 i love the addition of whole pecans and walnuts… very banana bread-y, but also a great surprise for granola! hello hot pink banana – im tempted now! banana bread spray…you should look into that! I’d totally buy it ;D In the meantime, granola for the win. This looks sooooooo good! I am drooling over the keyboard. YUM! This sounds HEAVENLY! You can never have too many good recipes to use up ripe bananas! 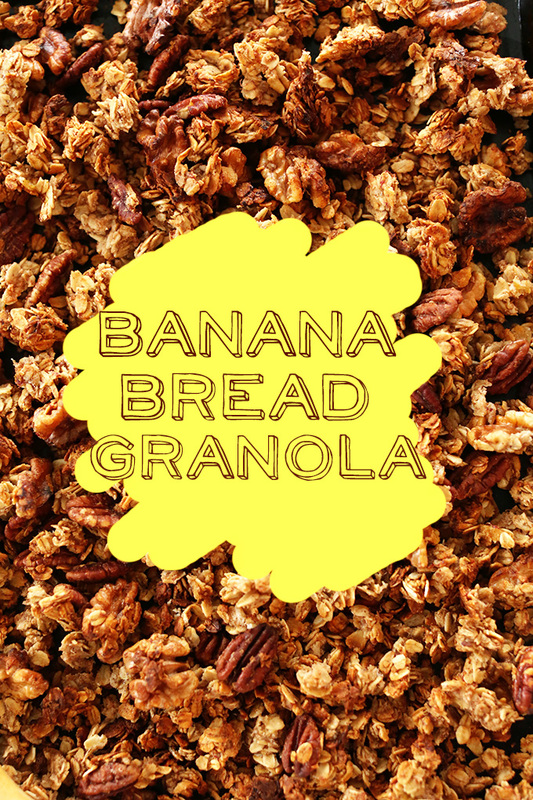 My daughter loves granola and banana nut bread, so I am going to make this for her ASAP! Plus I have a couple of bananas that need using, stat :-) Fantastic photos per usual! It’s another snow day here in Ohio–and this was the PERFECT recipe for today–just out of the oven, and my daughter and I have nearly devoured half the pan!! I think I may have to “hide” this when it cools!! It is perfection! Thanks! Ha! This made my day! So glad you and your daughter are enjoying it! Happy snow day!! This sounds delectable! 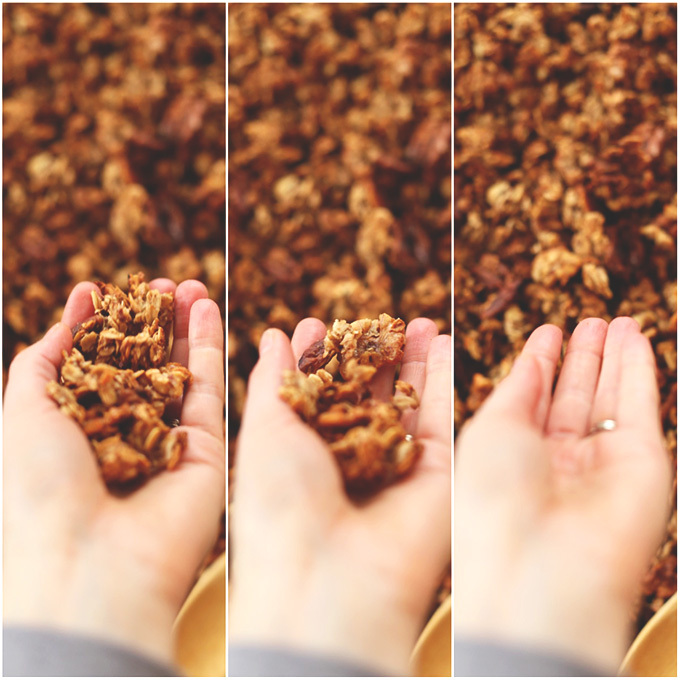 I’m a sucker for crunchy-sweet homemade granola clusters…definitely guilty of eating straight from the jar as I attempt to sprinkle it over yogurt. This is the first time I’ve seen this flavor combination for granola. Can’t wait to try it! Holy granola, this is pure genius! How did you get to be so clever, Ms. Dana?! I love how this clumps and clusters, the flavors sound like pure perfection, and the pictures are beeeyoootiful!! I am so making this. Me clever. Nah. YOU AWE. Lez be frands forever n ever, k? Pinned this one – looks and sounds so good! Something about making granola makes me feel like such a good homemaker ;-). I made and sell my own handmade vegan GF granola and this was one of my flavors last summer, if you have any other brilliant ideas, submit it to the contest! ha! yes, we have much in common. Thanks for sharing the contest info. I’ll give it a look! I could take a really bite out of this right now! Sounds great! Your photos, as always, look fantastic! I love throwing bananas in granola! It makes the most wonderful smell while baking and it also makes such awesome huge clusters. <3 I'm totally with you — I eat my granola right from the jar most of the time. This looks so amazing and delicious! I'm definitely trying it soon. Clusters for the win. Thanks Abbie! Yum! As soon as this popped into my inbox, I knew I had to try it. I just took it out of the oven and it smells amazing – and tastes pretty good right off the baking tray too! I couldn’t find pecans so I substituted some banana chips part way through for extra crunch and banana goodness. I was heading to the shops anyway, so I just grabbed the bits I needed :) Plus, I’m in Germany, so a different time zone (I didn’t really jump out of bed and have this sorted by 8:30am!). I look forward to more granola recipes! DO IT. Then instergramz it. BRILLIANT! Love these photos and that piece of wood is KILLER. Pinning fo sho. I’m best friends with that piece of wood. It’s true. Thanks friend! The smell of this banana bread is coming through the screen!! LOVE this! How much banana? 1/2 C? Or is it 1-1/2? 1 med banana seems like more than 1/2. Lisa, one medium banana mashed is about one generous 1/2 cup. That’s all you need! Too much banana and it will make the granola soggy. Hope that helps! Banana bread is my weakness! Can’t wait to try this! We have the same weakness. I’ve already eaten the whole batch and am onto the next! Can I substitute peanut butter for the coconut oil and maple syrup? Thanks! I don’t think so, not without compromising the sweetness and moisture level. Ive been making this granola at least twice a month for over a year and have tweaked it a bit for my taste. I substitute the oil for peanut butter. I also omit the coconut palm sugar and add raisins for more sweetness. Bake for 20 min, toss, rotate and bake for 20 more min. Comes out prefectly crispy and crunchy. I want my house to smell like banana bread! Sounds easy and fantastic!